My alarm vibrated at 6:30am, and I pulled out my earplugs (a necessary precaution when you’re sleeping ten feet from the train track) and looked out the window. It was a cool, misty morning in our cloud forest setting — exactly the weather one should have when setting off for a lost city in the mountains. I collected my things for the shower and glanced at Amanda to see if she needed anything in the bathroom before I went in. Her hand twitched just then, but it was clear she was not anywhere near awake (despite her later claim that the twitch was a sign of her being awake and alert), so I figured I’d let her sleep for a few minutes longer. Thirty seconds after I closed the bathroom door, a train whistle blasted the morning air and was followed by the deep voice-of-god rumble of the passing train. So much for Amanda’s extra sleep! We were both ready to go by about 7:30, and we knew that we should arrive at the trail head as early as possible so as to get a head start on the masses of tourists that we knew would be coming later in the day. But we also knew that there would be few opportunities to eat until we got back to town — and that the few there might be along the way would be exorbitantly overpriced. So we set out to look for breakfast. Given how touristy Aguas Calientes was, I fully expected that there would be any number of quick breakfast places along the path from our hostel to the bus station. I was wrong. There was nothing! We walked for quite a while before we came across a little restaurant offering a variety of “American” or “Grandmother’s” breakfasts. We sat down hoping for something quick and tasty to send us on our way. What we got was the slowest breakfast ever and food that was barely edible. The “toast” was smashed hamburger buns, the “pancakes” tasted like cardboard, and the “hot chocolate” may have been a mixture of chocolate, coffee and/or sawdust. The saving grace was a plate of fried eggs that we had ordered on the side in an effort to boost our protein intake. The eggs, at least, were good to eat. As slow and unappetizing as the breakfast was, it’s a good thing we had it. Food is not allowed in Machu Picchu, and the cafe outside the entrance was charging nearly thirty times the ordinary price of food (for example, a bottle of water that we got for 1.5 soles in Cuzco sold for 30 soles there). We had a couple of granola bars stashed in our pockets in case of emergency, but we did not eat anything substantial until we got back to Cuzco at about 9:30pm that night. 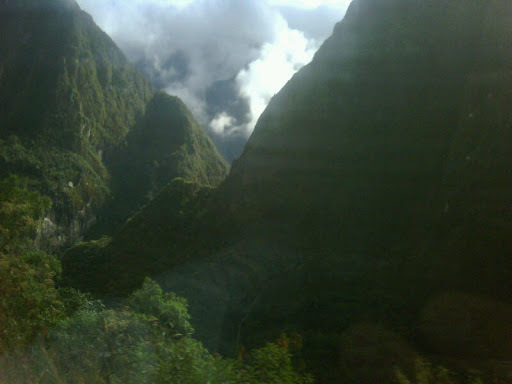 Aguas Calientes sits in the bottom of a deep and narrow canyon; Machu Picchu is at the top. To get from the former to the latter, our options were a 4.5 mile hike with a 1,500 foot vertical rise, or a twenty-five minute bus ride. We chose the latter. As the bus rose through a series of steep switchbacks, I initially was happy with our chosen transportation: we passed the foot trail in several places, and it appeared to be a nearly vertical stone staircase going straight up the mountain. But then the trees opened and I appreciated for the first time what an incredible canyon this was. It was some of the most dramatic terrain I had ever seen; a surreal wonderland that could have come straight out of some filmmaker’s imagination for a prehistoric world. I suddenly wished I was out there in the middle of that vista. I wanted to feel the steepness of the cliffs in the burn in my legs; to taste the mistiness of the air as I struggled to catch my breath. The enclosure of the bus felt stifling and far too safe. I couldn’t wait to get out. The first glimpse of the ruins came as we rounded a bend in the bus: A mass of stone walls and terraces rising out of the top of the mountain and descending down the impossibly steep slopes. From the low angle of the bus it was astonishing and imposing in the way that a clifftop fortress in Europe might be (only I’ve never seen a European fortress in anywhere near so inaccessible a location). It was breathtaking. The site appeared just as it had in all the pictures I’d seen, but this time I could see beyond the frame of the photograph. I could see the ruins, the cliffs, the gorge, the clouds; I could feel the height and the wind and the depth of the space. And I wondered: Why on earth would anyone think it was a good idea to build a city here? Why, indeed. It was a good question for our guide. Upon entering the park we had taken up with a guide named Ciro who had offered his services for a reasonable rate. He didn’t seem like a charlatan, and the other people in the group were few (only a couple from India) and seemed pleasant (we did not want to be stuck with someone like Australia or Boston). Ciro was a nice fellow, and his English was good enough to give sophisticated explanations as we went along. I also liked that he could acknowledge the remarkable qualities of the place while maintaining a certain tongue-in-cheek distance from the ridiculous “energy” mumbo-jumbo that so many hippie/new-age types are wont to slather onto formerly sacred ruined places (other guides had their flocks holding out their hands to bask in the aura that supposedly emanated from certain stones). 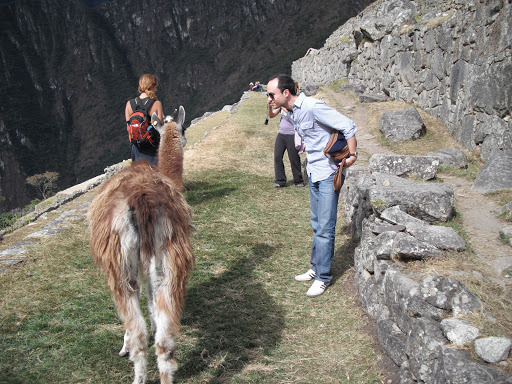 Ciro never really answered the question of why the Incas built a city here. Their general practice of living on hilltops was a way to protect against attack. It also facilitated worship, since the mountain-tops were considered to be sacred, as were the stars and sun that were more easily seen from on high. 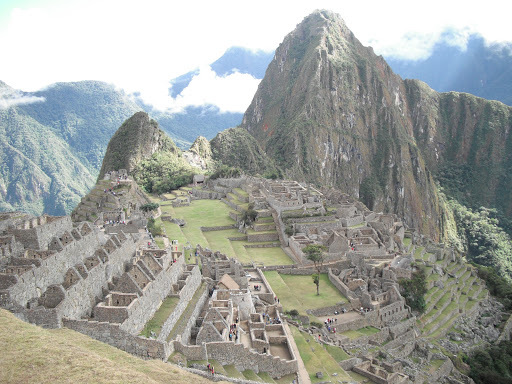 But the specific purpose of Machu Picchu is unknown. 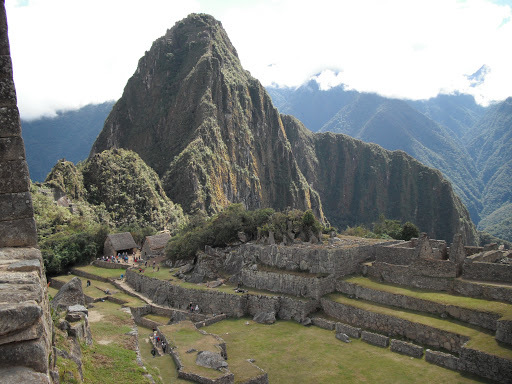 Some think it was a royal retreat for the Incan rulers. Others say it was a religious ceremonial center. 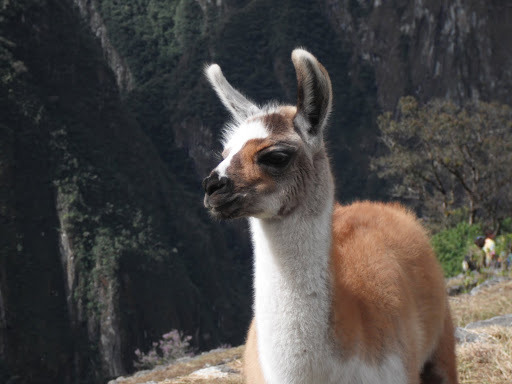 It was probably some combination of the two, plus whatever else may have motivated the Incas. In any event, the city is an engineering marvel. At its peak, the city was estimated to be home to approximately 600 people, which is fewer than I’d expected but still a sizeable population to sustain on the top of a towering cliff. 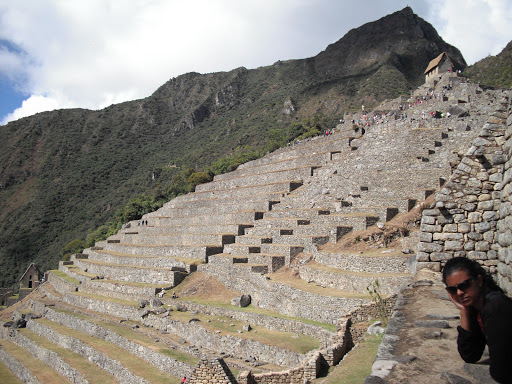 The large terraces were designed for optimal agricultural conditions (including proper drainage) so that the people living there could support themselves. They built a little canal to pipe in water from a (relatively) nearby spring. 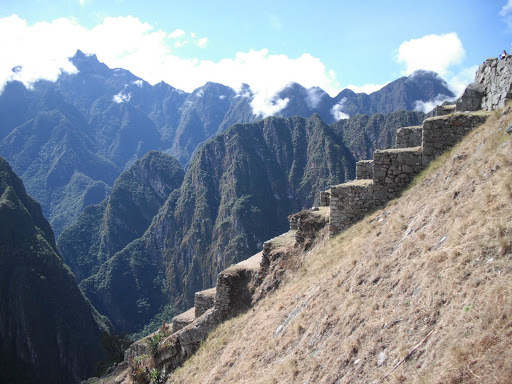 Roads (the famous “Inca trails”) to other cities emanated out along the ridges so that salt, meats, and other products that couldn’t be produced on-site could be shipped in. The astronomical constructions were equally impressive. 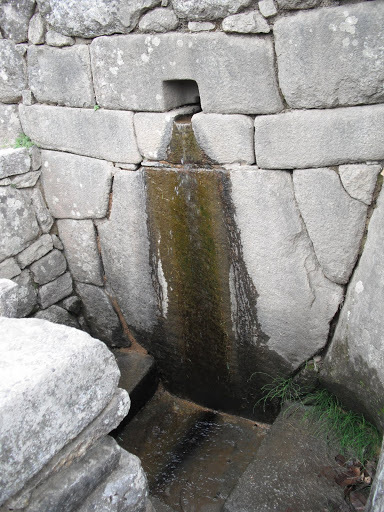 The Incas meticulously plotted the path of the sun for several years prior to commencing construction so that the temples would align with the solstices and equinoxes. 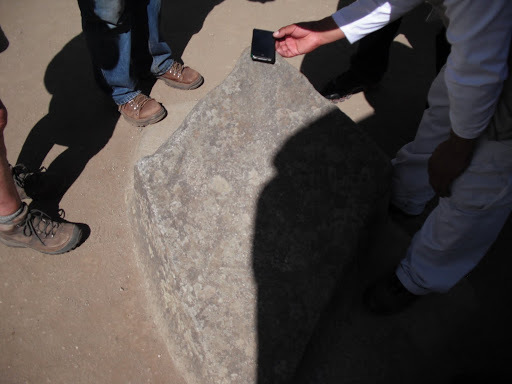 They also planted or carved large diamond-shaped stones indicating the four cardinal directions (with south at the top — the inverse of our north). As we continued the tour, we got to know our Indian companions a little better. They weren’t super talkative, but we learned that they were on a two-month trip through South America and had already been through Brazil and Argentina, and would be heading through the jungle to Bolivia and Chile next. Judging by the questions that the man asked, we suspected that he was an engineer. It also became clear that there were some differences between the two of them that paralleled some of the differences between Amanda and me. For example, as we clambered about the ruins listening to Ciro or taking pictures, the Indian woman and I were completely comfortable with the ledges and heights. Amanda and the Indian man, however, were really uncomfortable and kept resisting (or not) the urge to pull us back from certain death. Similarly, the Indian woman and I were both itching for some rigorous hiking, which Amanda and the Indian man had absolutely no interest in. Had we all known each other better, it probably would have been fun to split up for a while along these lines to do the things that the others didn’t want to do. 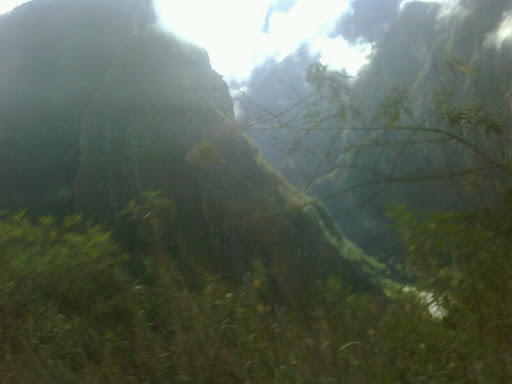 At one point during the tour (shortly after seeing the giant “guinea pig” rock), Ciro pointed out the Wayna Picchu trailhead. 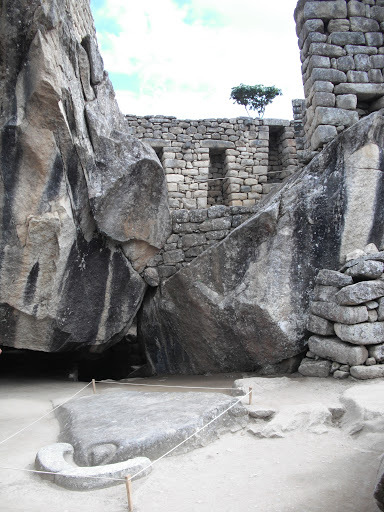 Wayna Picchu (which means “Young Peak”) is a towering mass of rock that dominates the northern end of Machu Picchu (“Old Peak”). 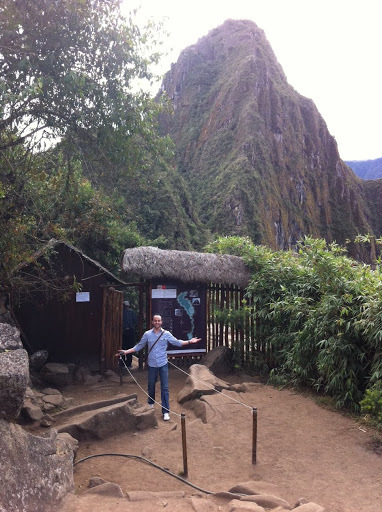 The trailhead that Ciro had pointed out runs from Machu Picchu to the cluster of ruins that clings to the peak of Wayna Picchu. 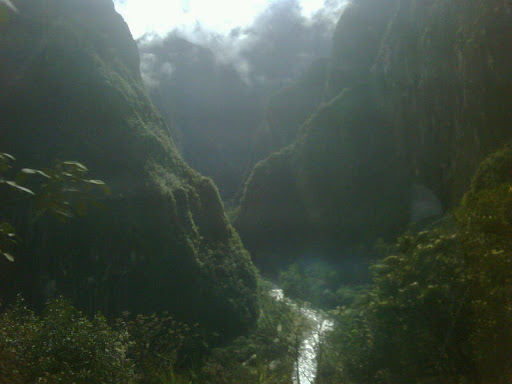 I had read about the Wayna Picchu trail. 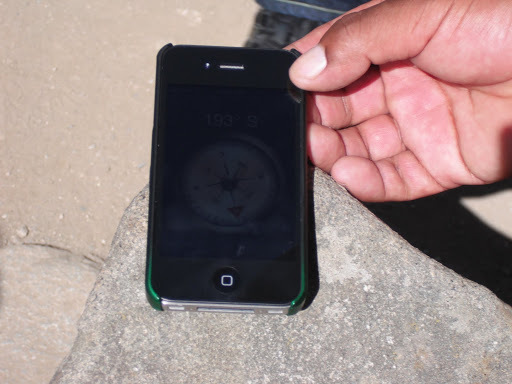 It’s known both for the difficulty of the climb and for the difficulty of getting tickets to climb. For conservation reasons (and probably safety reasons, given the width of the trail at some points) only 400 people per day are allowed on the trail. Those 400 tickets are usually snapped up first thing in the morning — the Australians we met on the train were planning to get up at 3am to get in line. For these reasons I had ruled out any possibility of climbing the peak. Imagine my surprise, then, when Ciro pointed out the trailhead and I saw people registering to climb. I asked if they were signing up for the next day (which I didn’t think was permitted) and Ciro said, No, there were still open slots for the day — they hadn’t hit 400 yet. That was it — I was done with the tour. The next few minutes, as Ciro kept going on about something that I had lost all interest in, I watched in agony as more people kept going through the gate to the trail. I had no idea how close they were to 400, but I needed to make sure that I made it in. As soon as Ciro paused long enough that I could politely interrupt, I asked him how long the hike normally took. Two hours, he said. Then I asked Amanda if she wouldn’t mind finishing the tour without me and meeting me back at the trailhead in two hours. Go ahead, she said. The rest of the afternoon was pretty peaceful by comparison. Amanda expertly took me through the rest of the tour that I’d missed with Ciro. She pointed out additional details about certain temples and carvings, and she explained what things meant and where the mummies had been found. Among these, I thought the rock of the condor was the most interesting. It’s a downward-facing bird — the wings rise above, the body and head are below on the ground; the white crescent is the bird’s white collar. 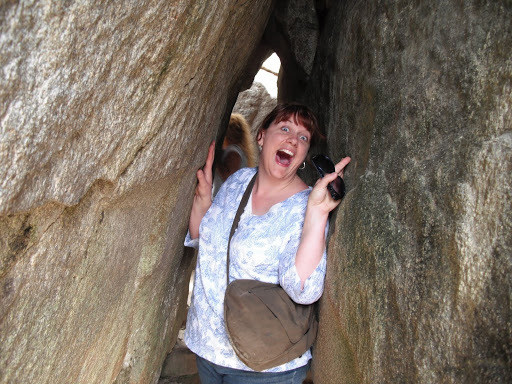 Through a crack in the “wings” you can pass to a cave with a niche in which mummies were found. 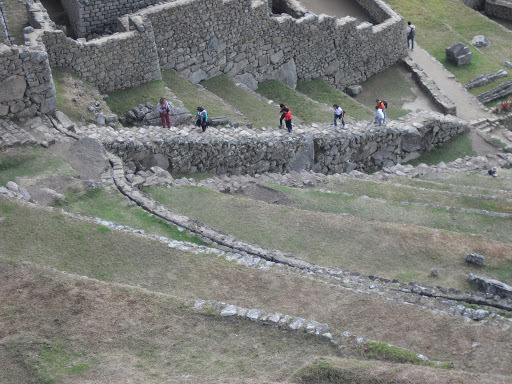 After finishing the “formal” tour, we just wandered around the site looking at the ruins and wondering about what the life of an Inca living in Machu Picchu must have been like. 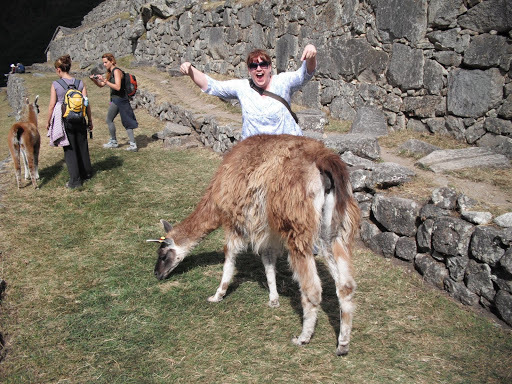 As we wandered, we encountered a llama and her baby, whose job it was to roam the park mowing down the grass. They were the first llamas we had seen on the trip, and they were pretty tolerant of over-enthusiastic humans, so naturally we followed them around and took pictures for a while. Eventually it started to rain a little, so I put on my rain coat and Amanda pulled out her umbrella, and we continued on. We had gone from bright sun to chilly rain, and in each weather pattern we had seen something new and different in the ruins and the surrounding mountains. After a while, we just sat down on one of the terraces, near the canal of running water, and just soaked up the place. It was supremely serene. It couldn’t last forever, though. We were starving and needed to use the facilities (of which there were none in the entire park), and our train would be leaving shortly. We put off leaving for as long as we could, but eventually we had to pack up and head back down the mountain. From there on, we were in perpetual motion. We rode the bus back to Aguas Calientes and boarded the train to Ollantaytambo (during which we were treated to a much needed snack and a much unexpected costume show and fashion parade — the costume show was nominally for cultural value; the fashion parade was a shameless but fun plug to buy the alpaca-hair clothing on display), and from thence to Cuzco via colectivo. This time around the colectivo was not a cramped little Toyota hatch-back but rather a cramped minivan of the sort I knew in Guatemala. (In fact, I was seated in exactly the same seat I occupied during the famous “Israeli Doritos Incident” that some of you may recall.) It was crowded and stuffy and smelled like people who needed to wash. Fortunately I was able to control the window from where I sat, so I could keep a steady flow of fresh air into the van. The driver was less reckless than our previous driver. He was much more cautious around curves and was more likely to be passed than to pass. Still, as we climbed up through the cloud layer toward Cuzco’s high plateau, the windshield would get terribly foggy and I was pretty sure the driver could see nothing (it didn’t help that the Virgin Mary and Our Lord And Savior had been joined by a couple of saints and were all doing their best to block any spots not covered by condensation). After we emerged from the cloud belt the sky opened up and I saw, for the first time, the full array of southern stars. It was beautiful, but also disturbing because I recognized none of them. There was no Big Dipper or Orion, only clusters of stars that I knew nothing of. I could see constellations that surely corresponded to some culture’s mythology, but anything more I couldn’t tell. Eventually I was able to pick out a set of stars that I believe was the Southern Cross, the only southern constellation that I really know anything about (but even that is next to nothing). I hope that before the end of this trip I can spend more time outside learning about the stars. The ride was uneventful. We got home safe and sound, if a little hungry and sore from the climb and subsequent inactivity. We got dinner at La Cicciolina, which is reputed to be the best restaurant in town — we rationalized that since we’d eaten virtually nothing since eggs that morning, we could splurge a bit on dinner. We decided also that we might as well give the cuy (guinea pig) a try. It was a little stronger than the dark meat of a chicken — more akin in flavor to the rabbit I’ve eaten. I thought the overall preparation was a little bland, but I didn’t mind the meat itself. Amanda was initially ambivalent on the flavor but has since come out strongly against it. After dinner we came homes, showered, took some anti-inflammatories, and went to bed.